Some people set goals and achieve them, but most people set goals and never achieve them. Why is this so? There are many reasons people fail to accomplish their goals and there are also quite a number of reasons people succeed in accomplishing their goals. In today’s post, you are going to discover the 7 things that you definitely want to know about setting your goals. For me, goal setting is a double edge sword. It can be the most powerful tool that can help you to achieve whatever you want in your life. And in the same time, it can be also one of the most lousy tools in your life. For example, if you set the wrong goal or goal that not what you really wanted, what will happen if you achieve that goal? You will feel a short sense of accomplishment, but your satisfaction and happiness may not be long. And some time you may feel empty even after you have achieved your goal. It will make the situation worse if you spend all your time and money to achieve it but it is not something what you really want. When you set goal, it means you have made a decision. And do you know what decision really means? If you Google the word decision, you will see that this word is originally a Latin word, ‘decidere’, means “cutting off or to cut off”. In other words, it actually means that your decision is final. When you set goal and decided to go for that aim, it has been decided, no more questions asked, it is final, there will be no other options for you anymore. This is what it means when you decided and set goals for something. The majority of people out there don’t know the meaning behind setting goal. They set goal as to workout in the gym at night, but after they reach home, the first thing they do is to switch on the TV or to open up Facebook. They feel tired and they said they will go to the gym the next day. This is the wrong practice about making decision and setting goal. After you have set your goals, you have made a decision on the spot that you will never settle for less. It means you promise yourself that you will do whatever it takes to achieve your goal, no question ask and no back out. This is why some people are extremely successful because they decide, they set goals, and they do whatever it takes until they achieve their goals. On the other hand, most people never practice the real meaning of decision making in their life, they tell you that they decided to go for this, but after awhile, they change and they told you they want to go for another thing. Never let this happen to you because this is very dangerous. Can you imagine that if this is the way you practice decision making how destructive this can be for you? You subconsciously program your mind to say that it is okay not to keep your promise and not to go for what you have set; it will be alright even if you did not do anything about it. This is why most people fail to accomplish their goals, simply because they are not serious about achieving their goals and keeping to their decisions that they have made to themselves. So starting from now on, once you have set a goal, that’s it, you have made a decision to go for it. No more question ask and there will be no pulling out. If you have set goal as to write an article by today, that’s it, do it before you go to sleep. No more excuses. Yes, setting goals and making them come true require your full, 100% commitment. Just like what I have mentioned above, when you set goals, it means that you have decided for what you want and you will never settle until you achieve it. Of course, you can always stop half way or change course, but if you do that, you will never achieve the original goal that you set in the first place. Talking about being committed, I strongly recommend you to read this, Sylvester Stallone: Are You Truly Committed To Success? Learn the commitment from Sylvester Stallone and see how he handle objections and setbacks. 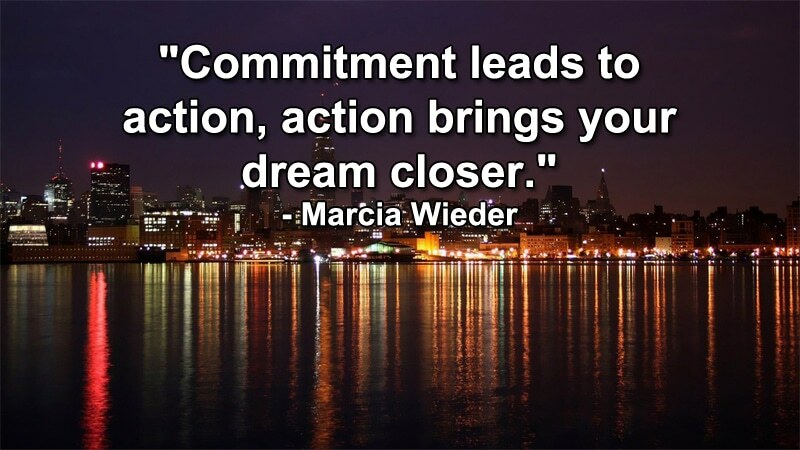 Being committed also means that you are willing to sacrifice for things that you have committed. If you have set goals to build a successful internet business using your night time, you have to have the commitment to do it. Like what Arnold Schwarzenegger said, when you are having fun, partying whole night, someone out there is working hard to achieve their dreams. I’m not saying that you cannot have fun. I’m just saying that you should know your commitment and know what to do. It is alright to have fun if you have done your work for the day. And it will be alright too if you enjoy life, provided that you have been working hard all the other time. Achieving goals are not easy, especially huge and bold goals. You have to give up to your soft life and commit to work hard toward reaching your targets. Too many people are addicted to their soft life. They don’t dare to get out of their comfort zone and they prefer to do what is convenient to them. Watching TV is convenient. Playing computer games is convenient. Sleeping is easy. Giving excuses and procrastinate on your goals are convenient. 3. Less Flexibility – Is This What You Really Want? After you have set your goal and decided to go for it, it will be less flexible for you to live life. This is what you definitely have to understand about goal setting. First is that you have to give up most of your leisure time as explained above, the second thing is that setting goal that is too specific may kill your creativity. So is it right to set goals? You have to be your own judge to answer this question. Like I said, goal setting is a double edge sword. It can help you or it can kill you. If you set the wrong goal, you will regret that you spend most of your time chasing for the wrong thing. Just like what this saying is trying to imply, “As you climb the ladder of success, make sure that it is leaning against the right wall.” You don’t want to reach to the top of the ladder and found that you are on the wrong wall. If this really happens, you will have wasted your time and effort. You need to spend more time and energy to get down and climb again on the right wall. Imagine that you are holding in your hand a stone as big as the size of your palm. Your goal is to use a hammer and hit the stone until it breaks into smaller pieces. So you take the hammer and hit the stone. What happen? Did the stone break into pieces? Highly likely, nothing is going to happen to the stone. So you continue to hit the stone on the second time and it never break. You hit it for the third time, the fourth, and continue until the tenth times and finally the stone crack and breaks into smaller pieces. Now, let me ask you this question, is it that the tenth hit that actually make the stone broke into pieces? Yes, but without the first 9 hits, the stone will not break, right? And can you skip all the first 9 hits and straight away put in the 10th hit and break the stone? No. This is exactly what is happening to most people about their goals. They try to work on their goal, but they give up on the half way and choose to go another goal. They are jumping from companies to companies, hoping from one opportunity to another. Therefore, make sure you set the right goal and work on it until you achieve it. Don’t give up half way and don’t get distracted and go for other opportunity along the journey. After you have set your destination, make sure you reach your destination in the end. It is alright to take a detour, but never lose sight about it. And make sure, your destination is what you really wanted to go. 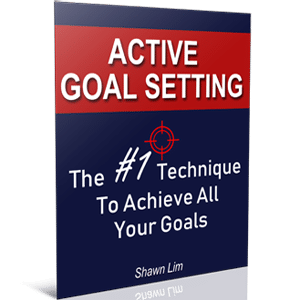 Here’s what can help you in setting your goals, How To Set Goals Step by Step. Most people never realize this and thought that goal setting is something that they need to do just once. Nope, wrong. You need to give life to your goals, just like planting, you need to take care of the plant and give it enough water and make sure it has enough sunlight. This seems very common, but the truth is that most people never treat their goals seriously and hence, they never write them down. You have to think with “ink”. Write down all your goals. It is said that a goal without writing down will be just a dream. When you write down your goals, you are telling yourself that your goals are something important and you put some priority on them, that is why you write them down. Again, most people will never do anything about their goals after they have wrote them down. Do you know why new year resolution will never work most of the time? It is because people will set their new year resolution in year end, and then they go and celebrate the new year. And guess what, they forgot about their goals the next day. You have to give life to your goals by reading them or reviewing them every single day. What I do every day after I wake up each morning is that I will drink a cup of water, sit on my sofa and read my goals. When you do this, you are programming your goals into your subconscious mind. You want your mind to automatically think about your goals all the time so that you will be reminded and to take action upon to reach them. This is another great way to keep your goals alive. By keeping them on track, you will know how your progress would be. This is a very important step that you definitely have to do if you want to reach your goals. First, keeping your progress can let you know what works and what won’t work. If you find out that things don’t work out, you can always change your strategy and try out again. Second, when you track your progress, you know exactly what you are. You can then better plan for your following steps of what you need to do. And furthermore, you will always make sure that you think about your goals since you are tracking the progress. Most people never track their progress because they did not even spend time thinking about their goals. And finally, if you know your progress, you can always reward yourself if you are moving forward and in the right track. You will feel satisfy and have a deep sense of happiness within you. You will have more confidence and able to accomplish even more. Success breeds confidence and confidence breeds more success. In the same time, if you are out of track or your progress is way too slow, it will be time for you to come up with a new strategy or to put in more effort and time to work on your goals. This is easy to do, and also because it is easy to do, most people never do it. All the above quotes are showing you that great and successful people manage their thinking well. They will never spend time thinking about negative things and nonconstructive ideas. You see, writing down your goals, read them every morning, track your goals progress and consciously think about your them are something easy to do and they are free. It does not cost you any money to write down your goals and it does not take you a lot of time to read out your goals either. Therefore, if you are serious about achieving your goals, follow through these practices and make them your habits. I don’t see any harm in doing all these. If your friends or partners laugh at your for reading out your goals or tracking your goals all the time, ignore them and continue to do it. Do you know that once you have set your goals and decided to go for it, there will be no failure for you. Why? The reason being that as long as you never quit, you will never fail. Imagine you started a business. You get loan from your parents for $100,000 and you invest all capital into your business. In the first year, you are not making any profit from your business and you lose $50,000 due to all the cost involve. Did you fail? In the second year, you work harder on your business but still you are not making any profit. You use up another $50,000 for your business cost and now you got no more capital anymore. Are you a failure? In the third year, things started to move and you break even this year. You did not make any money and you did not lose any money as your business break even. Did you fail? In the next 2 years, your business started to fly and you make $1 million from your business. Did you succeed? The problem with most people is that they give up way too soon and they define success in the wrong way. Most people will thought that they have failed in the first 3 years and they will simply give up and quit. They fail to grasp the concept that building a successful business takes time and success needs time as well. In fact, as long as you are working toward your goal and are making progress, you are considered a success. You don’t have to wait until you see the profit from your business only to celebrate your success. That is how our society look at our success. You are considered successful as long as you WORK ON YOUR GOAL. Just like the example above, in the first 2 years, even though you are losing money in your business, but at the end, you still make $1 million from your business. And you know what, the first 2 years are contributing to your success too. Thus you are successful as long as you work on your goals! You can set any goal you want, even to build an airplane like the Wright brothers. However, you must have the right strategy. Your goal will determine your strategy. Some people said that setting goal to make $1 million within a month from nothing is unrealistic. I would say that it all depends on your strategy. It will be unrealistic because you don’t believe in it and you are using the wrong strategy. Now, if you are running a business selling fruits by the roadside and you are making $3,000 a month, do you think that you can achieve your goal to make $5,000 a month? Most people would say yes, it is absolutely possible. You just need to work harder, open your business early and stay later. And perhaps even set up some promotion packages and include delivery services. What if you set your goal to make $5 million a month from your fruit business? Do you think this is possible? Well, 99% of the people would say that this is totally impossible. Here’s how you can do it. Obviously, you cannot operate the business by the roadside anymore. For instance, you will have to invest into R&D, develop all sort of product lines, set up franchise system, create dried fruit products, invest into organic fruit which has high demand recently, and you need to come up with solid business plan and even consider listing your business into the stock market. Do you think you can make $5 million a month now? Well, it is absolutely possible. Some people may argue over the time frame for big and bold goals. I would say that it all depends on your strategy. There really are people who are already making $1 million within a month. As long as you have the knowledge and resources, or know where to find the way, your goal will be possible for you. Remember, when there is a will, there is a way. Again, this is another principle that most people never notice in goal setting. Most people only look at the end result and not the journey. In fact, the most important things that you can achieve when working toward your goals are the habits and the thinking that you sow from the progress. It is your characteristics and your mindset that changed along the way that make you reach your goals. The results such as money that you earn is just the byproduct. In the process of working and reaching toward your goals, you will learn all the ups and downs, go through peaks and valleys, overcome all sort of setbacks, gain more confidence, take a lot of action, experience both success and failure along the journey, learn to make better decision, etc. These are the real rewards that truly count. These are the ingredients that will make you successful. A classic example would be Donald Trump. Trump is a real estate tycoon. However, did you know that he was filed for corporate bankruptcy for 4 times but still managed to come back and earn even more? How did he managed to do this? Well, it is simply because of his own characteristics and his billionaire mindset that he acquired along the journey. Whatever you have learned through the journey in achieving your goals will be yours forever. No one can take away your skills and your characteristics. And it is what within you that makes you successful. So stop focusing so much on the physical gain from your goals such as making a lot of money, driving luxury car, owning hotels, etc. These physical items are great motivation for you, but what really make you happy and satisfy deep within you would be the experience, the growth and the contribution you gain along the journey. These are the 7 things that you have to fully understand before you embark on the journey to achieve your goals. Remember these 7 ideas all the time and make sure you use goal setting in the right way to achieve the right results that you really want to accomplish in life. The things you explained to set the goals is correct, we are as one of the life coach in Bangalore agree with you. Apart from the above-mentioned thing to achieve the goal or set a goal taking action towards the goal is also very important. We are one of the life coach in Bangalore agree with you.